This quick tutorial shows you how to mount and map your Box.com storage in Ubuntu desktop so that you can access your cloud storage within Nautilus file browser. 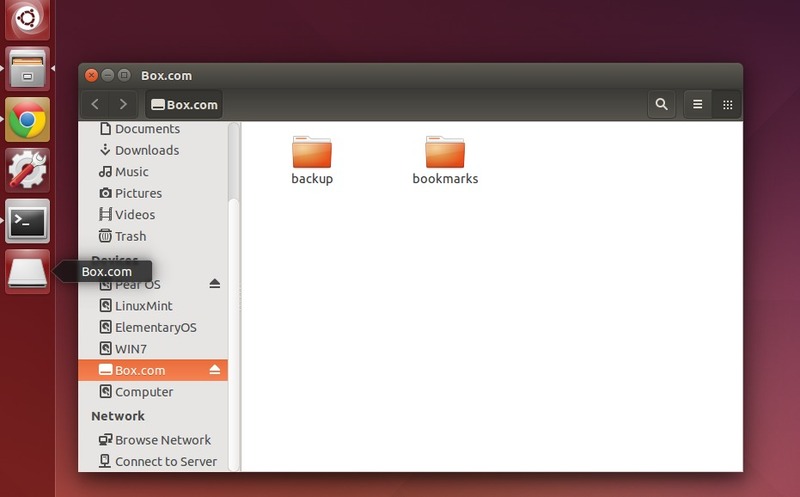 There are many cloud storage services available for Ubuntu Linux. Box.com is one of them that provides 10 GB free web space with 250 MB file upload size. It allows to access directly through WebDav protocol. There is an open source project Box2Tux, it makes the configuration of WebDav protocol easy. All you need to do is insert your Box account name and password, then it allows you to access the cloud storage directly in Nautilus file browser by mounting it automatically at start up. NOTE that normal user only have read permission to the mounted storage, you need to open Nautilus with root for full access (drop and drop to upload, delete, etc…). To do so, run gksudo nautilus in terminal or in Alt+F2 ‘Run a command’ dash. 1. First of first, install davfs2 (WebDav) from Ubuntu Software Center. You can click the link below to bring up Softare Center and click the install button. Once done, you should get box.com mounted just as a network drive on Unity Launcher. Enjoy! Other file manager function: Thunar, Pcmanfm, dolphin, konqueror and other. How can I configure box2tux to allow a non-root user to write files to the mounted box folder? Thanks! This seems to be the only functioning solution of all those floating around in the web. How do you stop Box from auto-mounting at startup? Didyou get an answer to this? I’m wondering the same thing. I entered an incorrect password! Thanks for the this great solution. How to umount? and using it to read only is a waste of time, how do I uninstall it? Fixed my problem of not being able to mount that drive in seconds. Thanks so much for taking the time and sharing. Works perfectly on Ubuntu 14.04. Hello everybody. The first time that I did that I’ve got no problems. Now my problem is that when I write ./box2tux I’ve got a mistake: Error al montar la ubicación: el volumen no implementa el montado. In English is more or less: Error mounting location: volume doesn’t implement mount. Any help? Thank you very much. Does any one know how to do this? You can log into your company account and go to account profile and add an individual password so that 3d party applications can access your account without going through the company authentication. Just be sure your email username matches whatever is written in your Box profile. The first password prompt is for your straight-up password. You’ll receive another password prompt that looks like you may have failed, and also should receive a two-factor auth message like you would logging into a new browser but longer. Type this 2FA code from the message at the second password prompt; this becomes your session’s password and should work until you log out of the dav. Thanks. It mounts. I can see it as a network drive and do usual operation (create folders, copy, move, etc. ), but only in the nautilus environment. How do I access the Box.com directory from the command line (e.g. rsync operations and such)? And then run command lines on it. There is, not surprisingly, long response times. Thanks. But while trying to login to my box.com account, it keeps asking me for my password endlessly. You have a fix for me? Thanks, I can acces my files now. I’m a bit new to ubuntu, but I was wondering whether is it possible to acces and run code that is in the ‘box’ via terminal? Thanks! General input/output error while accessing /run/user/1000/gvfs/dav:host=dav.box.com,ssl=true/dav/PTMOA FOLDER/Forms/checkout_agreement.xls. I have setup mount in Ubuntu. Now setup finished. Where i see my box files?? In Ubuntu 15.10 I have to manually mount box.com. How do I get it to mount on startup? Thank you very much! I was having all kinds of trouble with the “standard” way without box2tux. This worked the first time with no issue in Ubuntu 16.04. Thanks for the solution, but what should I do now? Will this work in Ubuntu MATE? I mean… I have mounted it succesfully but it won’t sync.